Exceptionally rare, turn of the century (1900) Steinway grand piano. If a picture is worth a thousand words, we shouldn’t need to elaborate on this fine instrument whatsoever. Professionally restored from top to bottom with Steinway parts, this piece of art is worthy of placement in a world class museum or symphony hall. This Steinway & Sons grand piano is both visually and musically a masterpiece. 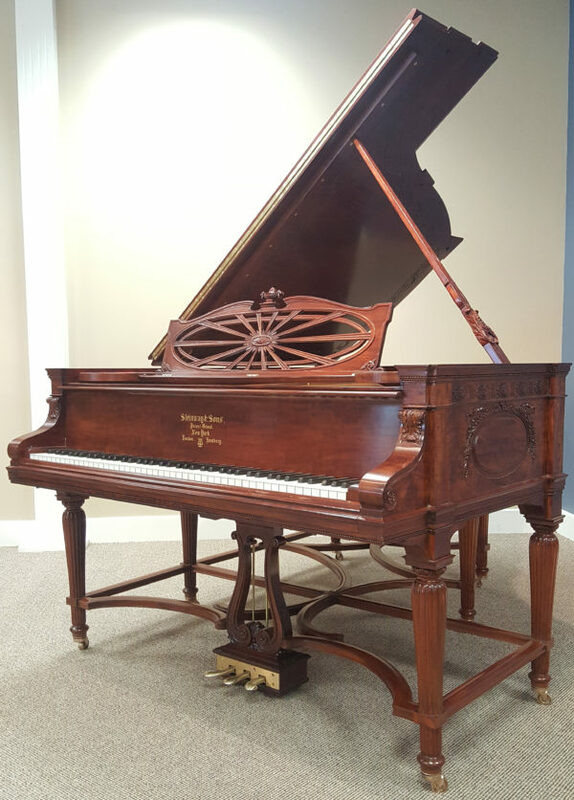 This mahogany artcase 6’1″ Steinway model AII was meticulously handcrafted in 1900. Note the intricate ornamentation throughout the cabinet which includes florals, wreaths, rosettes…even the lid prop and underneath side of the lid is lush with bas-relief carving! At the outermost ends of the original ivory keyboard, acanthus leaves adorn the top of the flowing, rounded arms. Lutes, lyres, mandolins, violins and trumpets are featured around the body of the piano in graceful, oval reliefs. If your desire is an investment that is both a rare work of art and a fine musical instrument that can be relished for generations, here is a once in a lifetime opportunity. View all of our Steinway grand pianos here. Mid-America Piano has been catering to your piano needs for over 30 years. Specializing in “like-new” pianos, we have over 100 pianos to choose from including grand, vertical, digital & player pianos. For more information or questions please call 800-950-3774.